"It is a war against all nations. American ships have been sunk, American lives taken, in ways which it has stirred us very deeply to learn of, but the ships and people of other neutral and friendly nations have been sunk and overwhelmed in the waters in the same way. There has been no discrimination. The challenge is to all mankind. Each nation must decide for itself how it will meet it. The choice we make for ourselves must be made with a moderation of counsel and a temperateness of judgment befitting our character and our motives as a nation. We must put excited feelings away. Our motive will not be revenge or the victorious assertion of the physical might of the nation, but only the vindication of right, of human right, of which we are only a single champion." June 28, 1914 – The assassination of Archduke Ferdinand at Sarajevo sets in motion the diplomatic maneuvers that result in war. August 1, 1914 – Germany declares war on Russia and on August 3, 1914, declares war on France. War becomes widespread. When Germany violates Belgian neutrality, Great Britain enters the war with the Allied Nations of France, Russia, Serbia, Belgium, and Japan against the Central Powers of Germany and Austria-Hungary. The war continues. Portugal and Romania join the Allies in 1916; Greece declares war on the Central Powers in 1917. April 6, 1917 – The United States breaks off its relations with Germany and enters the war. In June 1917, the first troops of the American Expeditionary Forces (AEF), commanded by General Pershing, land in France. I vote in honor of Allan Picard, who served with General John Pershing against the Mexican bandit Pancho Villa and later was one of the first men from Millinocket to enlist in World War I.
I'll be proud to cast my vote in honor of my friend, Everett McKenney, who served in the Army in France during World War I. In July 1999, he received the Legion of Honor, France's highest award given to foreigners, from the French consul. He died at the age of 104 on September 3, 1999. Although his military service had ended over 80 years earlier, it was still one of the most important, most defining, aspects of his life. I am voting in honor of my father, Grover L. Johnson, who served in the U.S. Army in France in 1918 and received a testimonial attesting to his patriotism, valor and devotion to duty from the State of Maine. My uncle, Sgt. 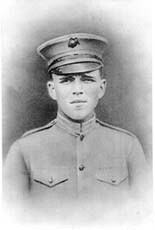 Guy Malcolm Yeaton, served with the 5th Marines, 2nd Division and was killed in action at Blanc Mont Ridge, France, on October 4, 1918, the bloodiest day of the war. 1,000 men had to take Blanc Mont Ridge where the Germans had been entrenched for 4 years. When the battle was over, the Germans were dead or running. There were 134 Marines left standing. Sgt. Yeaton fought in every major battle in France. He received the highest awards for valor that the French military had to offer, including the Cour de Geir. In letters home – all addressed from "somewhere in France" – the family learned he was recommended for the Distinguished Service Cross. To my knowledge, he never received it because he was killed shortly thereafter. If people like my uncle hadn't fought in WWI, would we be where we are today? Marion MacEwan, my great-aunt, was a Scottish immigrant who enlisted in the U.S. Army Nurse Corps during WWI. She served 10 miles behind the front lines in France. Nurses were ordered to leave the wounded if the Germans invaded, but all nurses refused to obey the order. She is buried at Arlington Cemetery. I will vote in honor of my great-uncle, George McKelvey, who was in the Army stationed in France in World War I. He was thrown in a pile for dead. When he came home, he carried with him his death papers. "McElvey's outfit, Company L of the 320th Infantry, was making an advance in the Argonne Forest on October 11, 1918, exactly one month before the Armistice. The Germans were beginning to crack up, but they were still putting up a tough defensive battle as they retreated. Everything was going well for George until a German machine-gun sniper ripped him with sixteen slugs while he was trying to dodge across an open clearing. From then on, he was unable to walk and totally unable to use his left arm. A corporal with his right wrist shot off carried, rolled, and dragged him to a First Aid Station behind the lines. There was rain, they ploughed through mud, and just before they got there, the Boche laid down a gas barrage. The two of them, with only two usable hands between them, managed to get gas masks adjusted on each other. McKelvey was then carried to a sector hospital to have some more patching done. The hospital was filled to the gills, and they had to lay him on the soggy ground outside with the other wounded soldiers. Five minutes after his turn came and he was moved into the hospital, a German shrapnel shell burst over the others still remaining in the courtyard. On February 2, 1920, after staying in hospitals in France and at Camp Meade, McKelvey arrived at his home in Johnetta, Pennsylvania. His family still thought he was dead and had a certificate from the War Department to prove it. They had even conducted funeral services at the family cemetery plot. But it was a gala day for Johnetta after they got over the shock of seeing a dead man walking. The Overseas Medal and the Order of the Purple Heart were awarded to George. He received them from Washington through the mail after the war." 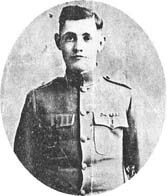 "On November 30, 1917, a 24-year-old soldier names Harold T. Andrews became the first man from Maine to die in World War I. He was killed while fighting off German soldiers with a shovel on the battlefield in Frnace, far from his Portland home. His valiant sacrifice was honored in 1921 with a memorial planting of linden trees along Baxter Boulevard that still exists today, even though the public largely is unaware of their symbolism." My father, Paul F. "Ginger" Fraser, served in France and Germany in the First World War as an officer in the infantry. He had to lift his gas mask to issue orders and the mustard gas left him with a damaged heart. He died at age 45 as a result of his heart damage. I will be proud to cast my vote on Election Day in his honor and in honor of all of our veterans. My father, Ralph O. Stevens, served in WWI. He was gassed in Germany. He died from it 15 years later. I was only 3 years old. Benjamin B. Twitchell, Sr., my father, served in WWI in the 151st Depot Brigade. A horse or mule kicked him while he was hooking up a piece of artillery equipment. Because of this accident, he lost his left eye and had to have a steel plate in his forehead. *The 19th Amendment to the Constitution, ratified on August 18, 1920, guarantees all American women the right to vote. I vote in honor of my father, Peter P. Mich, who served in the Army in WWI. I am paying tribute to my father, Morris Shapiro, who joined the Jewish Legion of the British Army in WWI. He served in Palestine and fought against the Turkish Army. He served in the same regiment with Ben-Gurion, future Israeli Prime Minister. Remained on front line until November 20th. I am voting in honor of my father, William A. Naimey, who served in the Army in World War I and gained his citizenship through the service. 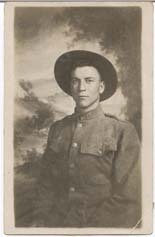 My grandfather, Wesley Thompson, was an American citizen who fought in the Army for Canada before the U.S. entered WWI. He earned the Victoria Cross but died in action 3 days before the war ended. My father, Walter Szlyk, came to the United States from Poland. He enlisted in the U.S. Army Air Corps during WWI and served at Kelly Field in Texas. I am voting in honor of my grandfather, Robert A. Craig, Sr., who served in Compay C, 301st Ammunition Train, Camp Devens, Massachusetts. He left Mars Hill on April 27, 1918, and after training at Camp Devens, he went by train to Montreal, then down the St. Lawrence to Quebec and on to Halifax. His convoy sailed from there to Liverpool, England, and then on to Cherbourg, France. During his military service he drove a Harley with a sidecar that carried officers to the front lines. This picture of him was taken in a French war studio in Noyers, France at a cost of twelve francs for one dozen pictures. Army pay at the time was $33.00 a month with $6.50 deducted for insurance, leaving him with a net wage of $26.50! After his service, he went on to earn his living repairing jewelry and clocks in southern and central Aroostook. My father, Frank Lumbert, was stationed in Massachusetts during WWI and on his discharge papers it states that he was saddler. My grandfather, Maurice LeBlanc, served in WWI and was used as an interpreter. He joined at age 42 – he lied about his age and ended up going to France with his son. My great-uncle, Donald F. Crain, is a WWI vet. He's still alive at 102!! At 11:00 a.m. on November 11, 1918, World War I ended – and the Armistice was signed. Germany had to evacuate its troops immediately from all territory west of the Rhine. The war ended without a single truly decisive battle having been fought. To calculate the total losses caused by the war is impossible. A conservative estimate is about 10 million dead and 20 million wounded. 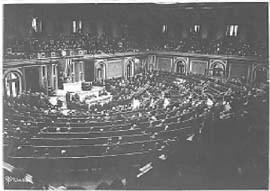 Because this immense suffering gave rise to a general revulsion to any kind of war, many people placed their hopes for peace in the newly created League of Nations. 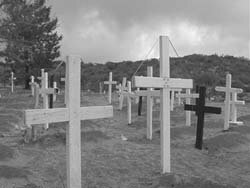 Regrettably, World War I, the "war to end all wars," represented a transition to a new kind of warfare, one that harnessed the power of air forces, chemical weapons, mechanized artillery and tanks – all of which laid the groundwork for the Second World War. 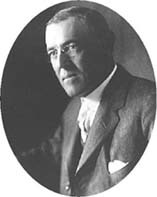 In 1919, President Woodrow Wilson proclaimed November 11th as Armistice Day to remind Americans of the tragedies of war. A law adopted in 1938 made the day a federal holiday. 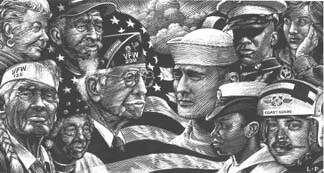 In 1954, Congress changed the name of the holiday to Veterans Day to honor all veterans. The following poem by John J. McCrae remains one of the most memorable war poems ever written. It recalls a terrible battle in the spring of 1915. Major McCrae was a surgeon attached to the 1st Field Artillery Brigade who had spent 17 days treating injured men – Canadians, British, Indians, French, and Germans. The death of a young friend and former student on May 2, 1915 so affected him that he composed this now-famous poem. Loved, and were loved, and now we lie. I will be voting in honor of my father, Frank Chester Black (1895-1961). Dad fought for the Army, as a private, in France, from 1916-1918. He served with the Co. A116 Ammo Train. He was from St. George, Maine. Although I never had the opportunity to know my Dad (he died just before my birth) my love for him transcends this small barrier. It is with great pride that I carry his memory with me on voting day and all other days as well. I would like for my fathers name to be entered into your list of men who served our country. My father Joseph Michaud served in WW I at the age of 18. He fought in France and received an honorable discharge in 1919. Fought in the Argonne Forest and died at Fort McHenry February 14, 1919 from wounds received. He was brought home to be buried. Served in France in either 1917 or 1918 he wouldn’t talk about it, and said it wasn’t much fun. My father fled the persecution of Czarist Russia, found freedom in the U.S. and served proudly with The AEF in France 1918-1919. 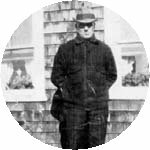 Chief Machinist Mate Scammon served in the US Navy from 1917 to 1918, stationed aboard the patrol vessel USS Wissahickon, at the Rockland, ME Naval Section Base. During WWI, my Grandmother served bravely on the front in France, as a Nurse in a MASH unit. In the operating room she met her future husband, Dr. Harold Grant Tobey, my Grandfather. Later, their son, Harold Grant Tobey, Jr. served and died as a result of WWII. My great grandfather Leroy Cotton died at Chateau Tierney, France during WWI in 1918, he left behind a baby girl who was my grandmother. My father enlisted in the Army in 1917 and was trained in chemical warfare. According to his medals he fought 5 battles in France as part of the original "Hellfire Boys". The First Gas Regiment. He was injured by German Mustard gas in March of 1918 and in 2003 he was awarded his purple heart. As the war came to and end and he returned home to Rockland, jobs were scarce. My father went back and enlisted and served 2 more years in the Navy. My father Went to meet God after many years of suffering with just one lung. The Mustard Gas got the other one. Spent his whole life as a totally disabled Veteran. He could not have a job. Was never able to hold a drivers license and lived with grand mall the rest of his life. He was a sniper, was captured, escaped and was hit by an artillery shell. Died from his wounds. A remarkable person. My great uncle Lawrence Buteau lied about his age and enlisted June 1, 1917 as a private in Company M, 16th Infantry. He had just turned 16. He was killed in action less than a year later in the Somme. When he enlisted he gave a false home address so, although his family saw his name on a casuality list, they did not get official notification for weeks. His body was repatriated 2 years after his death and he is buried in the family plot in Skowhegan. Enlisted: Portland, June 1, 1917. Private. Org: Co M 16 Inf. Overseas: Killed in action: May 6, 1918.